We are updating our instructions for the Factom Genesis. Here is a step by step guide to check your Factoid balance for Mac, Linux, and Windows with our new app, Factom Keymaker. Note that you will require your Koinify wallet 12 word passphrase to get your Factoid Address with our keymaker. Step #1 – Go to Factom’s Keymaker app on GitHub. There you will find binaries for Windows, Mac, and Linux. Step #2 – Download the one for your OS. Step #3 – Save it to a folder of your choice on your local hard drive. Step #4 – Pick the instructions for your OS. Enter your 12 words Koinify passphrase and hit enter. You should then see your Factoid Address displayed. Copy the Factoid Address that is shown in the Terminal window by selecting the text with your mouse then right click and select copy. Then drag and drop the keymaker-mac app to the Terminal window. You should see the below displayed in Terminal. Hit enter after that. Then double click the keymaker-mac app, when the app launches you will be prompted to enter your 12 words Koinify passphrase. 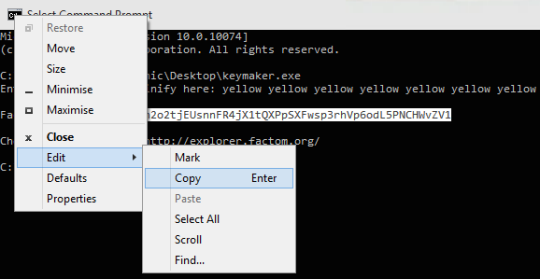 If you can’t locate the keymaker.exe this way, just locate it with Windows Explorer and your mouse then drag and drop it to the CMD window. You should see the below on your CMD window. Once the file has been located in your CMD window simply hit enter and the app should run. When the app launches you will be prompted to enter your 12 words Koinify Passphrase. Copy the Factoid Address that is shown in the CMD window by selecting the text with your mouse then right click on the top bar then select Edit/Copy. 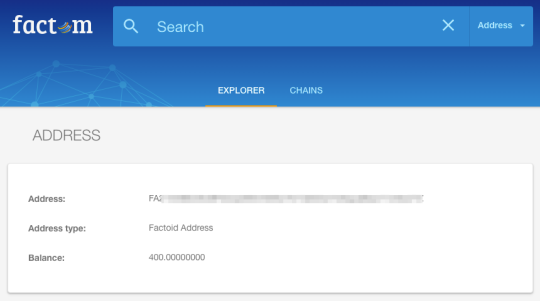 Step #5 – Go to http://explorer.factom.org and paste your Factoid Address in the search bar. Step #6 – See your Factoid Balance. At the most basic level, Factom is a truth engine. We use math to prove existence. Factom is the mathematical area to prove the existence of digital data. In this spirit, we have chosen the integral with double stroke to represent our software licence. “⨎” is a mathematical symbol for integral and it’s great that it looks like a little “f” for Factoid.